Tension. Authentic. Provocative. Humorous. Hope. Uncomfortable. Despair. Familiar. 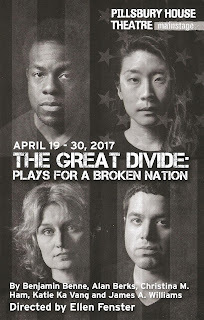 These were some one-word audience reactions to the performance of Pillsbury House Theatre's collection of new short plays last night, titled The Great Divide: Plays for a Broken Nation. I think we're all aware that the world is not the same as it was a year ago, or even six months ago. Theater is a great way to explore the issues that we're all grappling with, to understand them, to process them, to look for solutions. Pillsbury House jumped right into this by commissioning five local playwrights to write a ten-minute play with the title as their only prompt. The result is a diverse collection of stories and characters that are all of the above things, as well as incredibly relevant, timely, and necessary. Four incredibly talented actors (Tracey Maloney, Audrey Park, Mikell Sapp, and Ricardo Vázquez, the latter two recent recipients of the Ivey's Emerging Artist Award) bring all of these stories to life, directed by Ellen Fenster. The floor of the stage is painted with the all too familiar red and blue political map of the United States that clearly shows the divide, overlayed with the stars and stripes of our flag. The proud American colors of red, white, and blue take on a different connotation when used to illustrate our separation as a country rather than our togetherness. The five plays (with DJ Chamun spinning some cool tunes between them) range in tone from light and humorous, to dark and devastating, to dreamy and hopeful. No one is blamed, no one is vilified as the playwrights tell these stories that bring to light all the complexities of the issues we're facing. Two dudes strike up a hesitating and unlikely friendship in the sauna of their gym, one an African American, one a man from a small rural town who doesn't have much experience with "city folks." Maybe the best way to heal the divide is one-on-one, connecting with someone who's different than us. As long as we remember it's not their responsibility to teach us and fix us, and it can be a lot to ask. A woman is unexpectedly diagnosed with cancer and is overwhelmed by the tests and treatments she needs, with no way to pay for it. This moves the health care debate from the realm of numbers and theories to the reality of one person who needs help and support and doesn't know where to get it. A dinner party between two couples turns hilariously dark as issues of privilege and food preferences are discussed, in a play that could be subtitled, "Siri, was Hitler a vegetarian?" These awkward dinner conversations are all too familiar in the last few months; we're not sure what to say to whom, and things can escalate quickly. But at least we're talking, right? Four neighbors celebrate Independence Day in different ways as their neighborhood changes. Each has a different perspective on the neighborhood and the country, and things take a pretty bleak turn. This beautiful and lyrical collage of words, sentences, and stories contains perhaps the most poignant line of the night, "It'll never be perfect, but it can be better. It has to be better." The actors dreamily wander around the stage blowing and popping bubbles as they grapple with some heady ideas. "Most moments, I breathe. Yeah, me too." 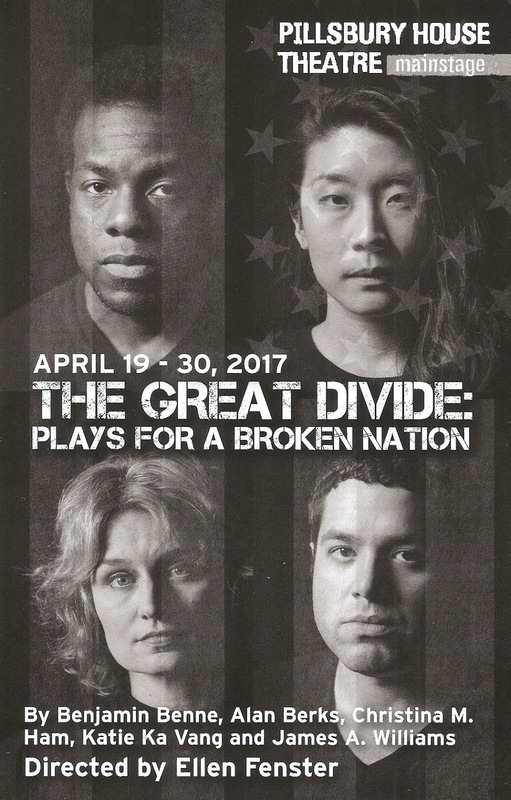 The Great Divide continues through this weekend only and performance have been selling out, so get your tickets now for this powerful and relevant new work. And stay for the talk-back, which Pillsbury House does better than any other theater I know, and somehow gets the majority of the audience to stay for it, which almost never happens. I'm incredibly grateful to everyone involved for presenting us with this material. I really struggle to wrap my head around the current political climate, so having these topics delivered to me in a format that I'm more comfortable with (that is, theater) makes it more palatable. It's so encouraging to see the shows selling out because I feel like people could easily shy away from the topics. They all gave me something to think about in different ways (and not just politics! ), and I'm so glad I went.